den April 17, 2016, 10:53 a.m.
New YouGov research of over 20,000 adults in every G20 country for Handelsblatt Global Edition reveals Russia is the only country of the G20 major economies where people would rather Donald Trump was the next President of the US than Hillary Clinton. 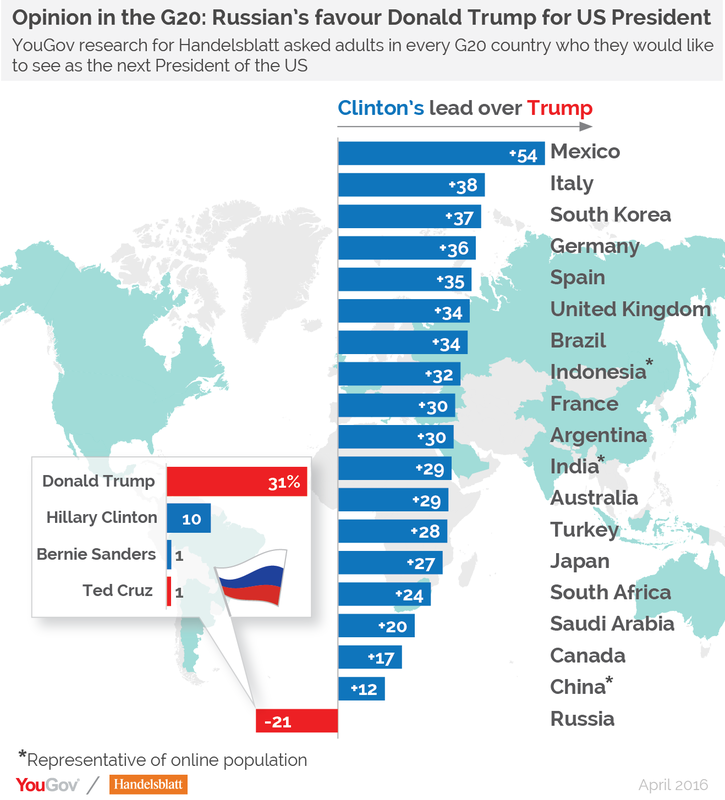 And by a long way – Trump leads Clinton by 21 points in Russia, while Hillary has a lead of more than 21 points over Trump in 15 other countries. Perhaps least surprisingly of all, Hillary Clinton's lead over Mr Trump is highest in Mexico, the country which a President Trump would screen behind a concrete wall along the US southern border. She leads Trump there by 54 points, scores ahead of the other G20 countries. Hillary's smallest lead over Bernie Sanders comes from Canada, but even then she leads by 17 points. 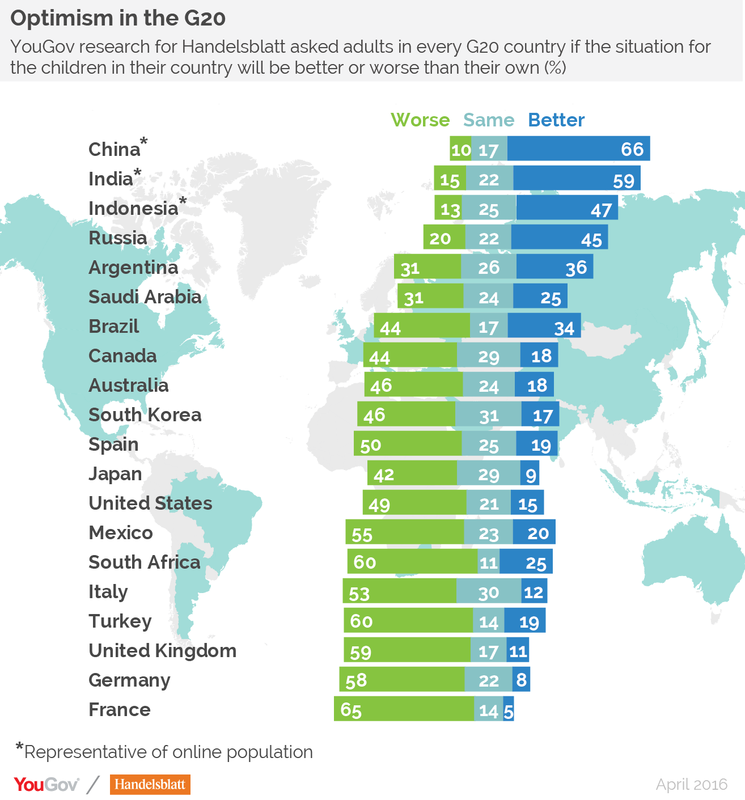 Meanwhile this rare insight into the lives of ordinary Russians reveals they have the second lowest personal economic satisfaction of the G20 countries, ahead of only South Korea. 79% of Russians say they are fairly dissatisfied with their situation while 19% say they are fairly satisfied. The UK is one of only three countries where a majority say they are fairly satisfied financially. 58% are positive about their situation while 34% are negative – a higher score than even Germany's. There is no evidence Russians blame Vladimir Putin for their poor economic outlook, however – and when asked which major world leader they trust most a near-unanimous 74% choose their President. The Dalai Lama comes second with 22%. They also rank as the fourth most optimistic country for expecting their children to be better off. Their low present economic satisfaction reconciles easily with the promise of a better future – and countries with high present satisfaction are more pessimistic about the future – but their optimism may also indicate faith in the leadership to weather the storm.